We are nearing the end of the month of October, known in a lot of parts of the world as the “spooky month”, and we have been reveling in horror movies, ghostly and ghoulish costumes, and sugar overload. It has been a lot of fun for those that take the time out to celebrate this kind of holiday, this kind of tradition. Little is known though about the two days immediately following October 31, and the fact that, again for some groups of people, these days hold some significance. All Saints’ Day (in the Roman Catholic Church officially the Solemnity of All Saints and also called All Hallows or Hallowmas), often shortened to All Saints, is a solemnity celebrated on 1 November by parts of Western Christianity, and on the first Sunday after Pentecost in Eastern Christianity, in honor of all the saints, known and unknown. In Western Christian theology, the day commemorates all those who have attained the beatific vision in Heaven. It is a national holiday in many historically Catholic countries. 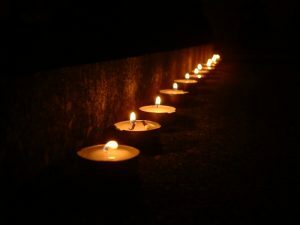 In the Roman Catholic Church and many Anglican churches, the next day, All Souls’ Day, specifically commemorates the departed faithful who have not yet been purified and reached heaven. Catholics celebrate All Saints’ Day and All Souls’ Day in the fundamental belief that there is a prayerful spiritual communion between those in the state of grace who have died and are either being purified in purgatory or are in heaven (the ‘church penitent‘ and the ‘church triumphant‘, respectively), and the ‘church militant‘ who are the living. Other Christian traditions define, remember and respond to the saints in different ways. Does it sound like a lot to take it? I can understand that it would. Especially for those who choose not to look at days or traditions that are religious in nature, these two days and what they appear to mean is a lot to adjust to. In my country, which is known to be very Roman Catholic, these days are observed and are also often declared holidays so that families have time to make arrangements in the other provinces within the country. But this tradition has also changed in practice and in meaning to a lot of people. Before, these two days really did mean that families all went to cemeteries, in the Metro and in other provinces, where close relatives are buried, spend time around gravestones, light candles, pray and reflect on the dearly departed. Today, this holiday is also used as just general time to get some rest and to spend time with the family. Yes, people do still go to cemeteries to pray for their dead. They still light candles or bring flowers. But some families also bring food and drink as a form of celebration for the life or lives of loved ones who have passed. It sounds morbid, true, but a lot of people find more comfort in remembering their dead during the good times, retelling stories of past achievements, funny moments, memorable events. Others choose to remember and pray in a different way. They go to church, light candles there, and pray specific prayers for their dearly departed. Then they retreat to family homes and have dinners or lunches, not parties with revelry, but more of gatherings with food where family can spend time together, maybe catch up with relatives and friends who live far and who are only seen at this time of the year, and just remember good times and good people; To remember, to reflect, to be with family. So, I bet you are wondering why I chose to blog about this. Well, aside from the fact that these days a few days away, being a single mom has made me more aware of the traditions I would like my kids to be exposed to and the meaning of family, death, the importance of life, memories, and making sure you live to the fullest, strive to be happy and good. So close after Halloween, the days of witches and ghosts, and a month away from Christmas, it seems to me a good time to pause the partying and to think about the people that matter the most and the meaning of death and life. I don’t know if you all have similar traditions but it would be interesting to find out the ways in which you celebrate life, reflect on death, and emphasize family. Do you observe All Saint’s Day? I can still remember the anticipation I felt – as a child – waiting for Santa. My brother would usually wake up first – several times actually; 10pm, 12am, 2am, then finally at 5am — I would get up with him. I don’t think that kid even slept a wink; he was just so excited. We had to wait until 6am to wake our Mom up though. It seemed like that hour took forever. Thank goodness our stockings were always right outside our bedroom doors, so we would go through those while we waited. When I think back to some of my favorite Christmases; I can still feel the butterflies of excitement, the thrill of discovering I had received my most wished for gift and how happy I was to read the letter that Santa had left for me – ME! Even though I can still tap into those feelings and the excitement of that time – part of me – wasn’t sure I really wanted to do the whole Santa thing with the boys. I really never expressed this to anyone (they would surely think I had lost my mind), and it’s hard to explain how someone – who loves everything about Christmas – could even consider, not allowing her children the same magical experience that she had, growing up. It’s been hard for me to really explain how we go from; “Santa visits you and brings you toys” to “We are celebrating Jesus’ birthday.” If it’s hard for me to figure out how to explain it, you can imagine how hard it would be for a preschool age child to understand it. Clearly — I needed to learn more. So, I decided to go in search of the first Santa – St. Nicholas. I was very happy to discover a web site devoted to St. Nicholas. The St. Nicolas Center was able to really connect the dots for me. It showed me how I could incorporate Santa (which represents the spirit of giving) without feeling like I was taking away from the true meaning of Christmas; which if course is to celebrate God’s greatest gift — the birth of Jesus Christ. To gain a better appreciation – and more understanding – of this wonderful man; I encourage you to visit the site yourself. There is a lot of great information to be gleaned from this web site and many activities geared toward children as well. I can now explain to the boys that St. Nicholas was a man who loved Jesus very, very much! He loved Jesus so much that he decided to follow His teachings, and rid himself of all his worldly possessions. St. Nick was a kind and generous man who lived to make people happy, to protect children, and to provide for those in need. St. Nicholas represents the spirit of giving — and there is the magic. When we give gifts out of love instead of obligation — that is when we can be joyful and experience the thrill and delight that the season brings. 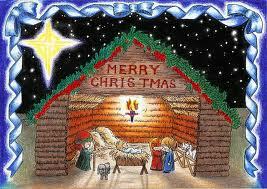 Jesus is the meaning and the true reason for the Christmas season. Teaching children to give and give with love, is link that connects Santa and our Savior.